The greatest show on earth is in the heavens, and it is performed by God. No cinema is as stunning as the daily sunrise and sunset. Here are five photos I have taken of sunsets. They cannot do justice to the glory of seeing them in person, but at least they capture the memories that I have of each one. Here are the photos, and the stories behind them. Please share in the comments which one is your favorite. #1. SUNSET AT COOPER LAKE (above). I took this photo a few years ago at Cooper Lake, Morton, Mississippi, where I was with my wife’s family reunion. I like the reflection on the water, the silhouette of the cattails, and the framing of the tree above. #2. 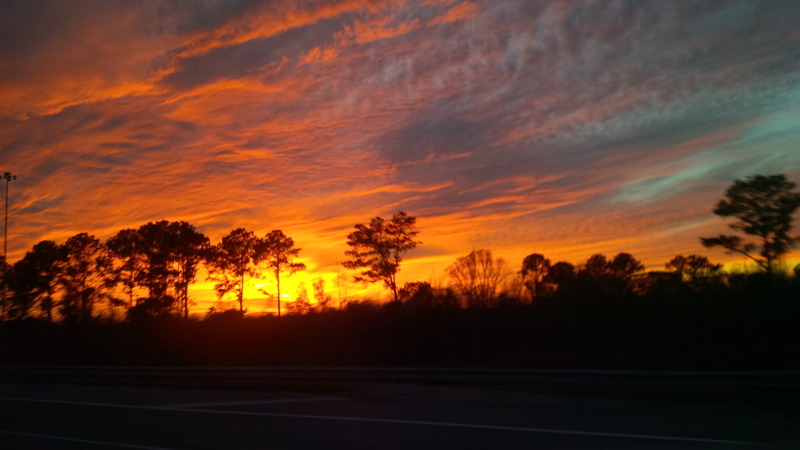 SUNSET IN NASSAU COUNTY, FLORIDA (above). I was visiting my younger daughter, Lauren, who lives in Florida, and was walking in her subdivision, when this sunset grabbed my eye. I love the vivid colors, the reflection on the water, and the framing of the pine needles. #3. SUNSET ON COUNTRY PORCH (above). This photo was taken on my sister-in-law and brother-in-law’s porch, who live in the country in Scott County, Mississippi. Although it is at sunset, this photo is more about other things: the long shadows, peaceful grass and gentle path, and the rose bush. The rose has a special memory, because it was planted and tended by their son (my nephew) Brian, who died this past winter. We think of him when we see the rose, and think of his sunrise when we see the sunset. #4. SUNSET STEEPLE (above). For the past year, I have been interim pastor of First Baptist Church, McLaurin, Mississippi. One Wednesday night, I arrived at the church and I was awed by the sunset behind the sanctuary, so I quickly snapped this picture. #5. SUNSET IN THE CLOUDS (above). This photo was taken from the swing in my front yard in Hattiesburg, Mississippi. The tall pines prevent us from seeing the actual sun as it sets, but one evening as I was sitting in the swing, I was captivated by the sun’s reflection on the clouds. I hope you enjoyed these photographs as much as I enjoyed taking them. So which is your favorite? Please share your thoughts in the comments.